He really resembled the Yomiuri Giants legend when he stroked a history-making home run into the right-field seats. 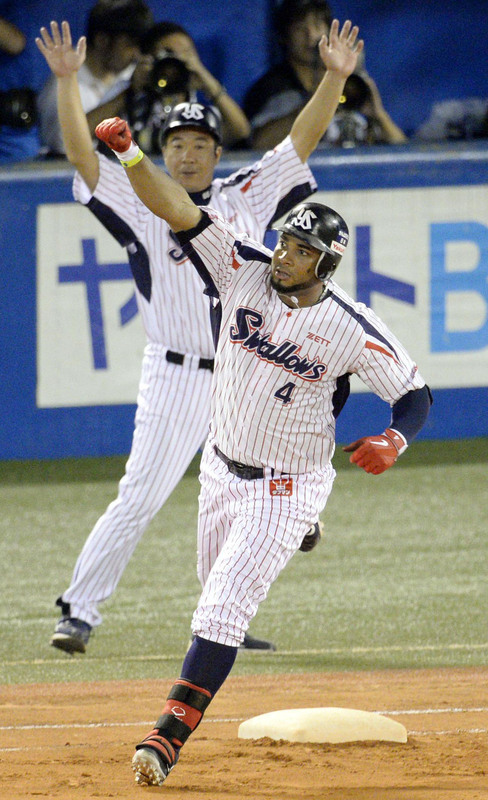 Balentien sent a fastball deep to right in the sixth for his 55th home run of the season which tied the NPB single-season record held by Oh, Tuffy Rhodes and Alex Cabrera during the Tokyo Yakult Swallows’ 6-2 loss to the Carp on Wednesday at Jingu Stadium. Balentien moved into rarefied air, joining Japanese baseball great Oh, who first set the current record in 1964, Rhodes (2001) and Cabrera (2002) as the only players to hit 55 home runs in a single season. Balentien is far ahead of the pace of his predecessors and has 22 games left to hit one more and take sole possession of the single-season record. His 55th homer came at an opportune time, as he was expecting his mother to be in attendance for Thursday’s game. Now he’ll only need one good swing to make history with her watching. After grounding out in his first two at-bats, Balentien took a ball and a strike from Carp starter Kan Otake before latching onto a 147-kph fastball. The homer was Balentien’s fourth off Otake this season. Balentien extended his fist in triumph as the ball went into the stands and slowed to a walk as he touched home plate, clapping his hands and pointing to the sky. He was given flowers near the Yakult dugout, exchanged high fives with his teammates and shared hugs with beloved Swallows veteran Shinya Miyamoto and team mascot Tsubakuro. Still, he kept the celebration somewhat reserved as the Birds were trailing 6-1 at the time. In a total reversal from the contentious environment that surrounded previous attempts to break the record, which has been tainted somewhat by claims of cheating and xenophobia in earlier years, Balentien received a round of applause from the visiting fans when he took his position in the field to start the seventh. Balentien was known for his power during his time as a top prospect in the Seattle Mariners’ system. He spent parts of three years in the majors — with the Mariners and Cincinnati Reds. He joined the Swallows in 2011 and hit 31 homers in each of his first two seasons to win back-to-back Central League home run titles, leading all of Japan in 2012. Balentien missed Yakult’s first 12 games this season with a groin injury, suffered while playing for the Netherlands in the 2013 World Baseball Classic, but hit the ground running and started racking up homers at a torrid pace. Balentien said getting to 55 was the hard part and is relaxed as he attempts to claim the single-season record for himself. Despite giving up the home run, Otake went home a winner in the game to improve to 8-9. Masanori Ishikawa (4-8) was charged with the loss. Brad Eldred homered and drove in two runs to lead the Carp. Even so, all eyes were on Balentien afterward, and the spotlight will follow him as he chases No. 56. The Chunichi Dragons rode a three-run eighth inning to come from behind and beat the Hanshin Tigers 3-2 at Koshien Stadium on Wednesday. The Tigers have lost five of their last seven games. At Tokyo Dome, Yomiuri won its fourth in a row after Ryosuke Miyaguni (6-6) labored through six innings to contain Yokohama for his first victory in a month. 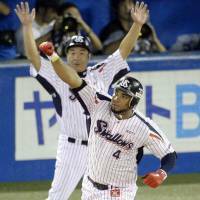 At Kleenex Stadium, Andruw Jones and Casey McGehee each hit three-run home runs as Tohoku Rakuten thumped Chiba Lotte behind seven shutout innings from starter Manabu Mima (6-4). At Sapporo Dome, Masaru Takeda (8-6) and three relievers combined on a six-hitter in Hokkaido Nippon Ham’s second straight win against Orix. At Yafuoku Dome, Seiichi Uchikawa and Nobuhiro Matsuda had two RBIs apiece as Fukuoka Softbank hit Seibu for six runs in the fifth inning.